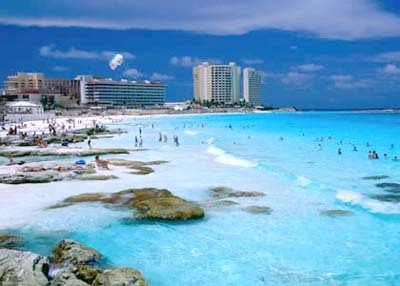 In the last two decades Cancún has grown from a tiny jungle village into one of the world's best-known holiday resorts. The Mexican government sunk vast sums into landscaping and infrastructure, yielding straight, well-paved roads, drinkable tap water and great swathes of sandy beach. Quintana Roo was little more than a forgotten backwater for most of the 19th century. So insignificant was this jungly, sparsely inhabited region in the minds of Mexican authorities that it didn't even have an official name until 1902. Cancún is in the enticing state of Quintana Roo, home to the country's Caribbean beaches, impressive Mayan ruins and sizzling nightlife. 1902: it was finally given a name and territory status, it was named after army general Andréas Quintana Roo, although he'd never served in the territory. 1960: When the Mexican government decided to develop a resort on the island, the channels separating it from the mainland coast were bridged. Next, a town sprang up (where Ciudad Cancún now stands) to house Isla Cancún's construction workers and their families. Isla Cancún was a sliver of sand visited only by local fisherfolk and a few gringo adventurers. Many hectares of mangroves and scrub brush were ripped out, scores of gardens were planted, and 'a very towered land', as one 16th-century Spanish historian described this coast, acquired even more towers as multistorey resorts went up. A well-paved street bordered by wide sidewalks was run down the centre of the island. 1974: Cancún opened, the carefully developed island - commonly referred to as Cancún, Isla Cancún or the Zona Hotelera - was promoted as a tropical paradise.Quintana Roo didn't become a state until that same year. In short order it began attracting snowbirds from Canada and wealthy beach bums from the USA, Europe and elsewhere. And it likely wouldn't have received statehood even then, except that the government and developers ambitiously planning Cancún agreed that the new resort town would be difficult to promote if it were situated in a region apparently unworthy of statehood. 2003: It came to international attention with the release of a movie, The Real Cancún, featuring the antics of the beach bunny crowd, and again when it hosted a round of World Trade Organisation talks, which featured the now customary demonstrations and ended in bitter acrimony when representatives from third world member states refused to play ball. Despite its inauspicious beginnings, Cancún has become one of the brightest spots on the international sun-seeker map, although many argue that high-level corruption, the drug trade, overdevelopment and the resultant environmental pressures have spoiled the place.